Located in the northwest Caribbean at 19 N 81 W the three Cayman Islands enjoys mainly tropical weather conditions with slight seasonal variation. The unique position places the Cayman Islands far enough north to be affected by cold front during the winter and still within the belt that is influenced by tropical waves and hurricanes during the summer. Climatically the year can be divided into two seasons - the wet, summer season, generally from mid-May through October and the dry, winter season, from November to April. 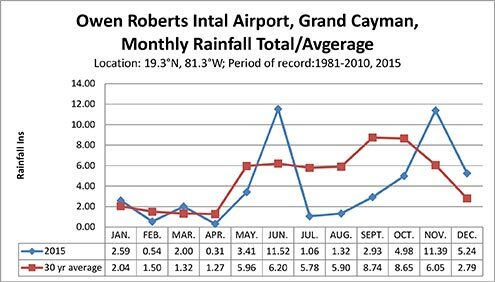 Average Annual Temperature & Rainfall for 2015 Taken at Owen Robert Intl Airport. 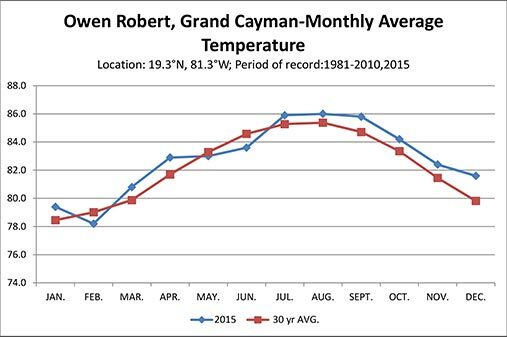 The average annual temperature for 2015 was 28.2 degrees Celcius or 82.8 degrees Fahrenheit. The highest recorded temperature, which occurred on September 14 th was 33.5 degrees Celcius or 92.3degrees Fahrenheit. The lowest recorded temperature was 19.2 degrees Celcius or 66.6 degrees Fahrenheit on February 20th. Rainfall varies over the Islands and seasonally. Rainfall for 2015 totaled 1201.2 mm/47.29 inches, which is 8.91 inches lesser than the normal of 1427.4 mm/56.20 inches. The wettest month was September with 292.6 mm/11.52 inches recorded. The driest month was April with 7.9 mm/0.31 of an inch recorded. The most rainfall in a 24-hour period was a record 126.5 mm/4.98 ins. on June 5 th . The average wind for 2015 was from the east at 8 knots. The windiest month was December and June when wind speeds averaged 09 knots, while the lowest wind speeds of 5 knots were recorded in September. For month of April, August to October the prevailing wind direction were from east to southeast, while an east to northeast wind prevailed for the rest of the year. The United States of America has daylight saving, however the Cayman Islands, being nearer to the equator, has fairly equal periods of day and night year round. There’s really only about an hour’s difference in daylight between June 20th and December 20th. So all year, Cayman has the same time, -5 hours Coordinated Universal time (UTC). This means the Islands share Eastern Standard Time (EST= -5 UTC) with Miami and New York from November through April. When the USA switches to Daylight Savings Time in April, Cayman then shares Central Daylight Time (CDT= -5 UTC) with Chicago and Houston.